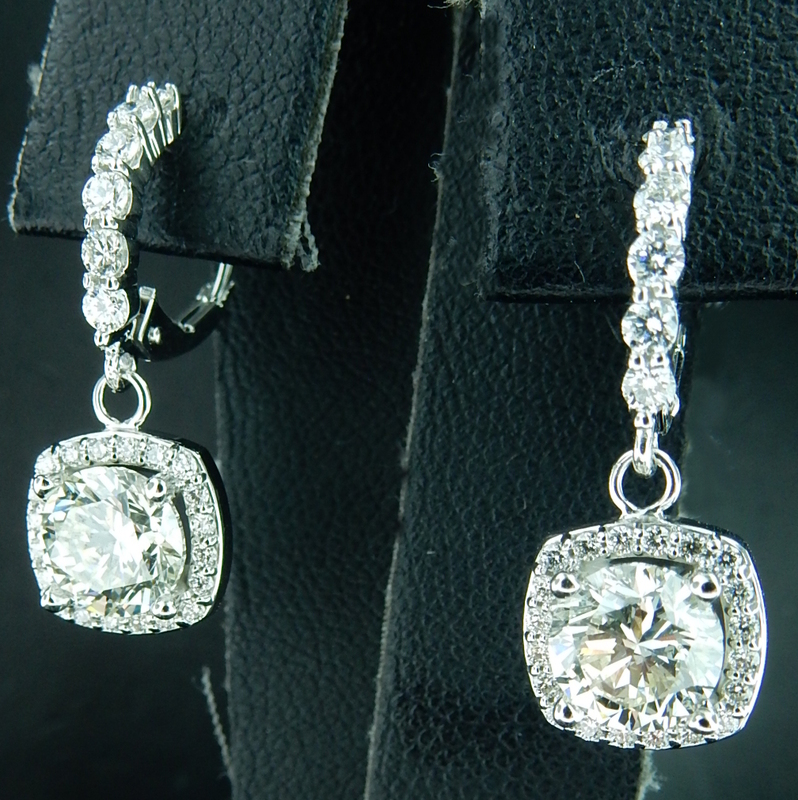 Diamond Halo Lever Back Dangles! You will turn heads with this beautiful design. We are able to reproduce these in any diamond size or color/clarity combination, to be a truly unique piece in your collection! This stunning graduated diamond necklace will be the talk of the town. 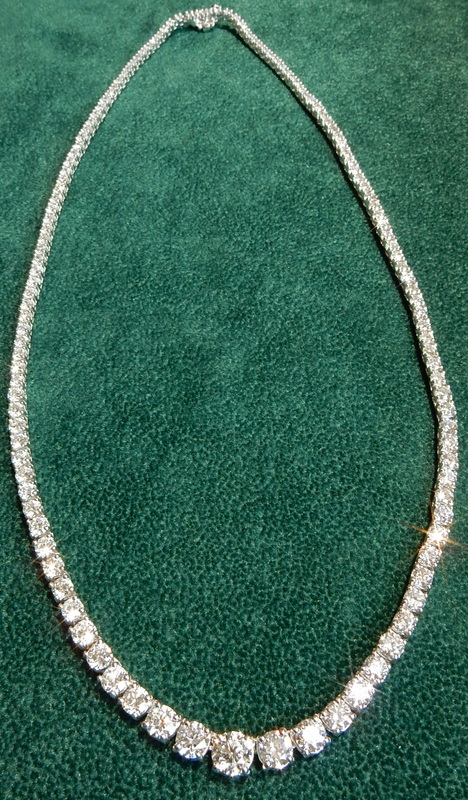 Measuring 18" long and containing 14.50 carats of round brilliant diamonds, this piece will be sure to turn heads. 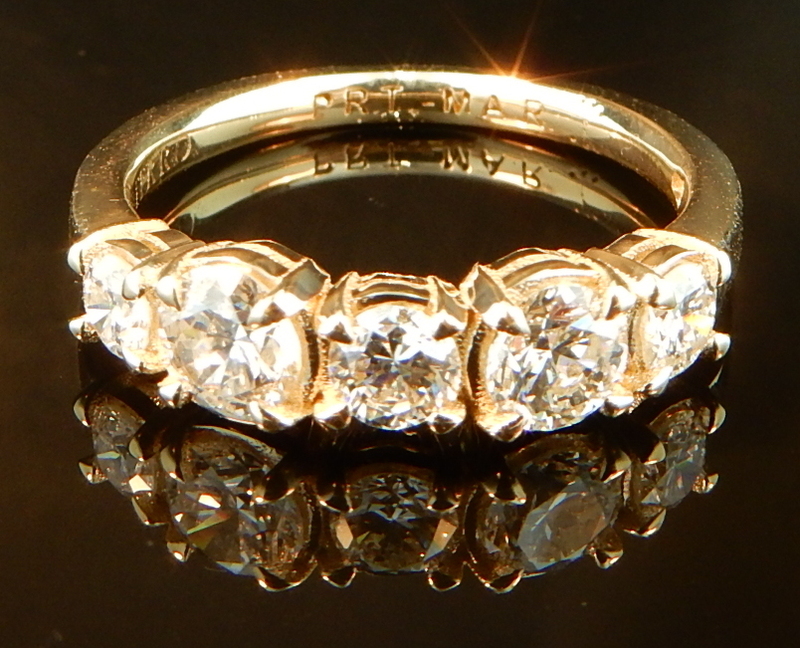 This delicate 14k yellow gold design alternates diamonds of differing sizes to create a unique and sparkling look! Jazz up your already beautiful diamond with a new setting! Turn something that sits in a drawer into something vibrant and wearable. 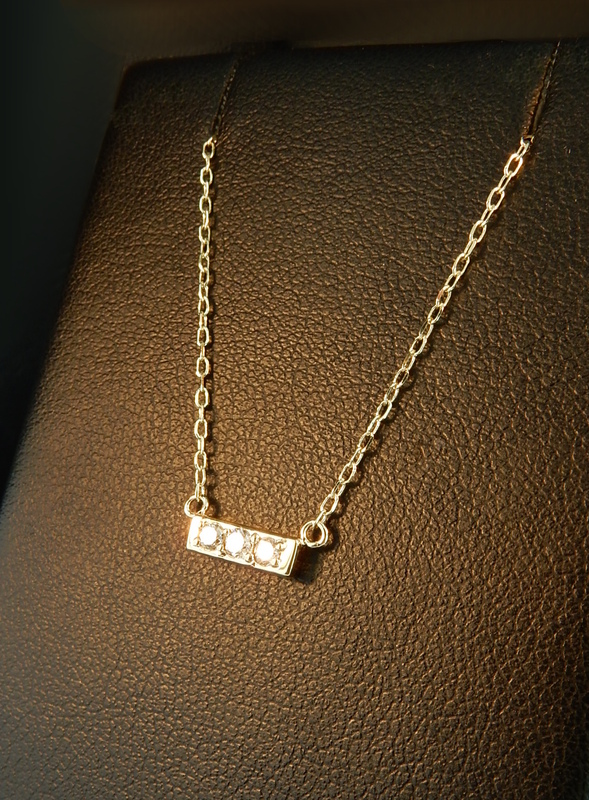 This beautiful necklace is something that can be worn every day. 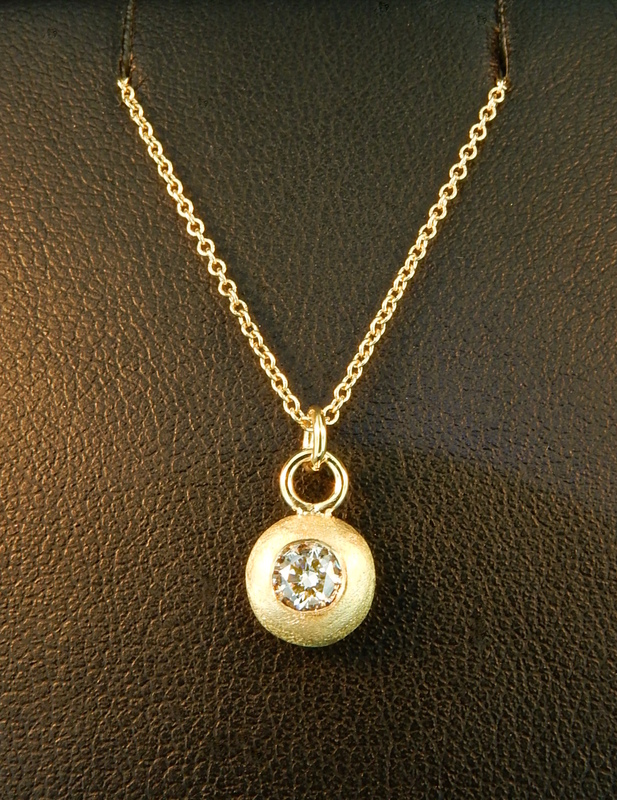 Have Ferro Jewelers take an old piece of jewelry you don't wear and create something incredible! 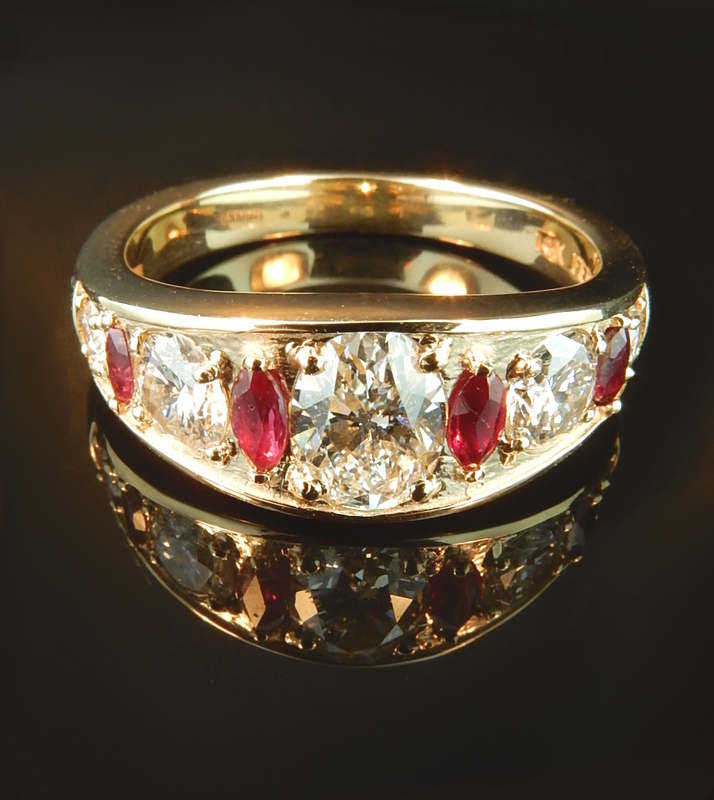 This amazing alternating ruby and diamond band is truly one of a kind. The sparkle of the diamonds complimented by the rich red hues of the rubies creates a timeless look that is unforgettable. 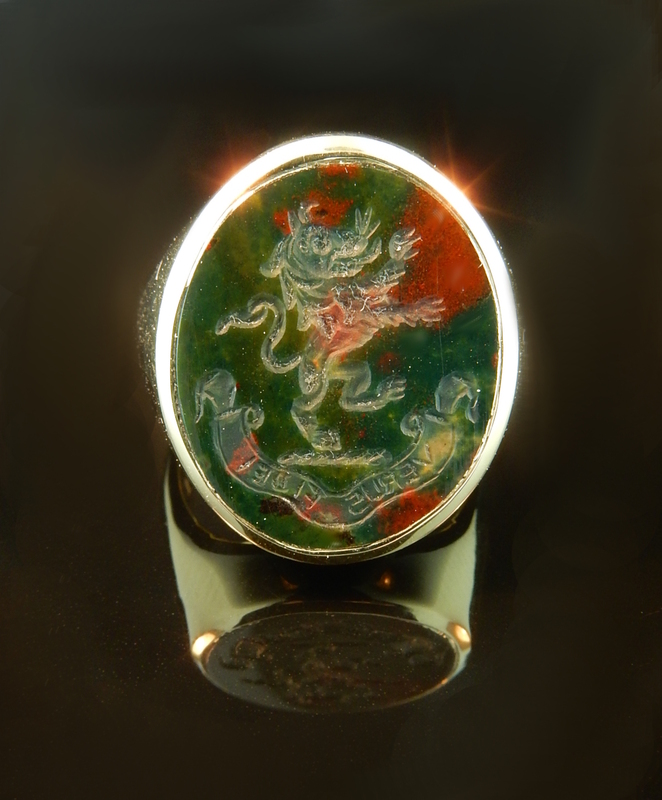 These two bloodstone signet rings came out perfectly! Their detailed carving fills these beautifully designed pieces with originality. 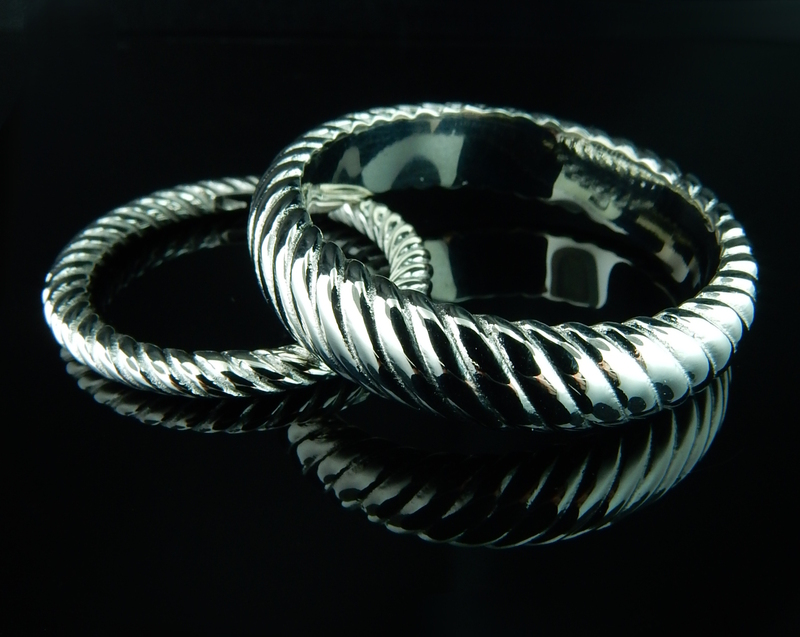 This amazing set of platinum wedding bands was specifically created to match a stunning David Yurman engagement ring. These heavyweight bands compliment each other flawlessly and complete a unique suite. 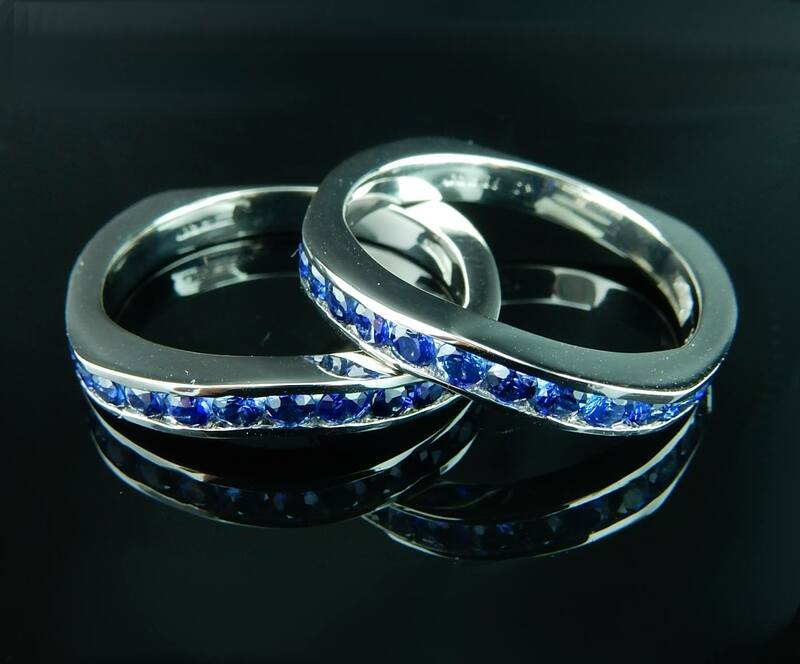 Custom made platinum sapphire bands that fit perfectly with customer's diamond engagement ring. 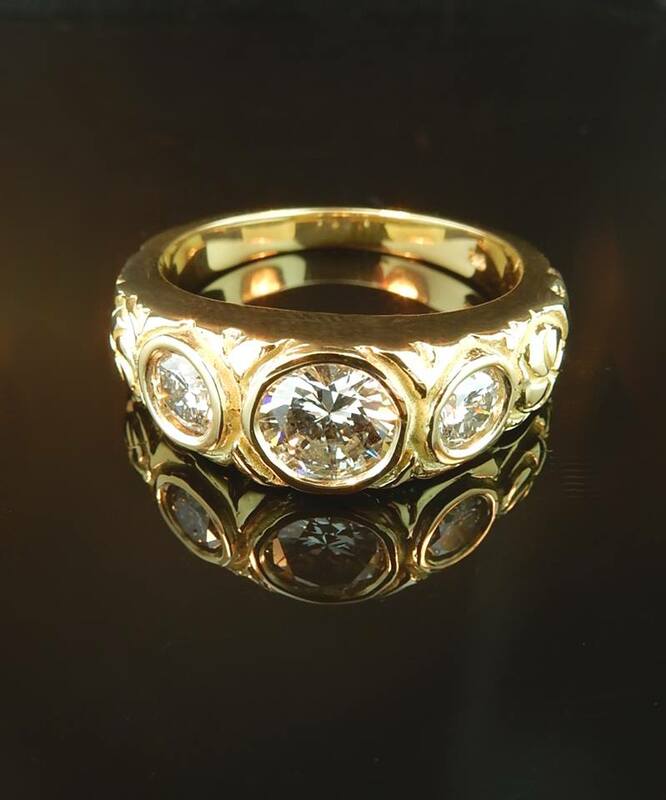 Custom made 18k yellow gold Art Nouveau style three diamond ring. Ring features one 0.63ct center round diamond with VS clarity and H color. Center stone is accented with two round 3.90mm diamonds with a carat weight of 0.23ct each. Accent diamonds have a clarity of VS2 and G color. Total diamond weight is 1.09tcw. Ring is a size 7. The dazzle from this ring is tremendous. 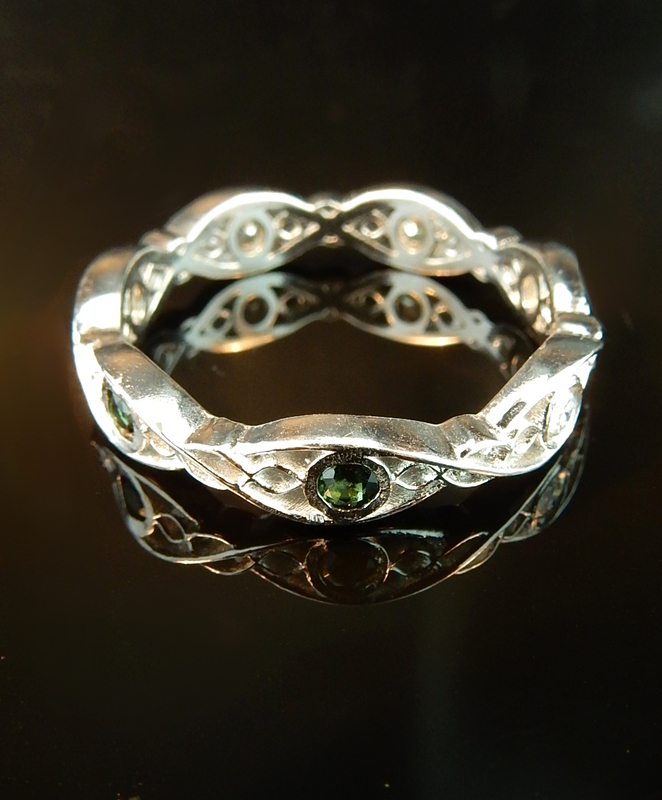 It shows true craftsmanship in the Celtic design. 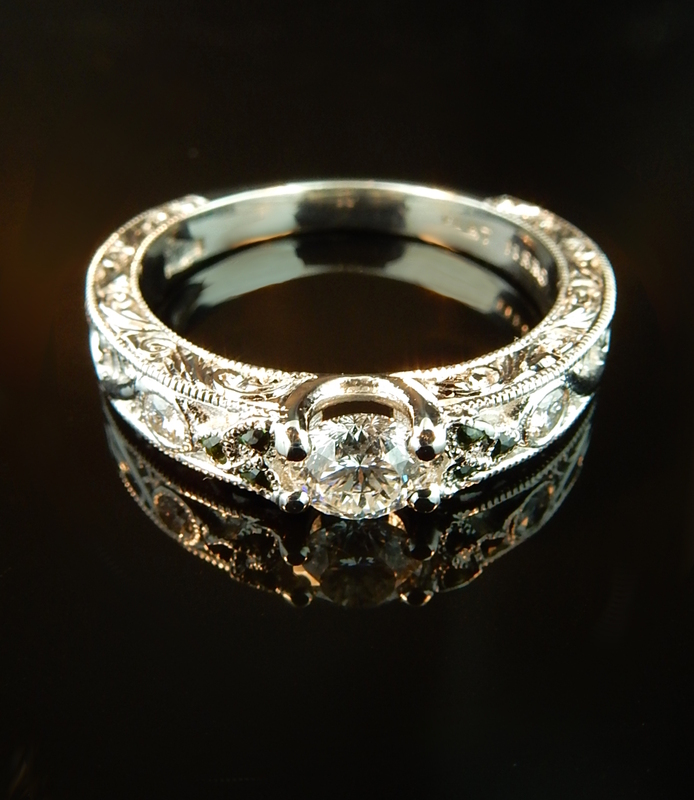 Set in shimmering platinum, this ring is truly one of a kind! The delicacy of this band is stunning. Set with beautiful green tourmaline and diamonds, the appeal of of this custom design is endless!